InduSoft has just released the new service pack to InduSoft Web Studio, and it can now be downloaded on our InduSoft download page for free! The new service pack to Indusoft Web Studio offers exciting new enhancements and functionality to a powerful SCADA/HMI software platform. Service Pack 2 is offered free of charge to users with InduSoft Web Studio v7.1, or the entire SCADA software package can be downloaded for a free trial. Native support for HTML 5 screens and animations – Graphical interfaces created with the standard screen editor of InduSoft Web Studio can be visualized in web browsers such as Internet Explorer, Chrome, or Safari. This support of HTML5 allows uniform visualization on differing platforms, including Windows, iOS, and Android, though the SMA (Studio Mobile Access) interface. Service Pack 2 supports native Shapes, Active Objects, and Animations. Built-in debugging tools for VBScript – InduSoft innovates again, providing built-in troubleshooting tools for the native VBScript editor of InduSoft Web Studio. The new tools include code-stepping, break-points, and a variable watch list to further increase productivity and accuracy while using VBScript in InduSoft Web Studio. Tags database functions – A new set of built-in functions allow you to create tags, delete tags, or modify tag properties during the runtime. This feature increases the flexibility to design generic templates that can be easily customized to each project, even during the runtime. Native XML screen schema – New built-in functions allow you to import screens created in XML format into the standard binary format of InduSoft Web Studio. Support for new languages – In response to the global expansion of InduSoft Web Studio, the development environment will be provided in new languages, Russian and Simplified Chinese, in addition to the already existing languages of English, German, French, Spanish, and Portuguese. Alarm Custom Fields – This feature allows you to customize up to 10 additional fields to the history of alarms. Tag Integration – InduSoft Web Studio allows you to browse and share tags configured in the PLC programming software directly in the HMI/SCADA editor. This version included support for the ABTCP (Allen-Bradley DF1 over TCP/IP), Koyo (AutomationDirect), PAC3K (AutomationDirect), and SCHNE (Schneider PLC)drivers, in addition to the list of interfaces already supported by the tag integration feature. 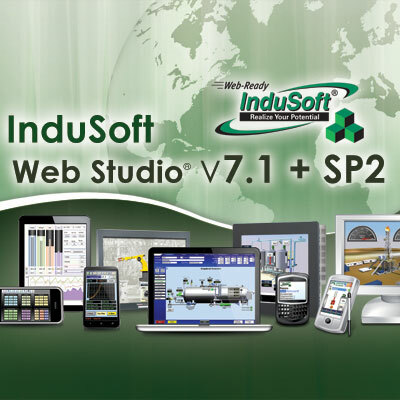 To download InduSoft Web Studio v7.1+ SP2, please visit our downloads page. You must be logged into your account to access the download. If you have not yet completed your registration to the InduSoft Website, or if you need any assistance, please contact us. We will make certain that you are able to access the site and download the newest version of InduSoft web Studio. Have a good day .. and thank you for your support.